As the destination for providing spiritual direction, celebrating marriages and births, and offering help in times of grief, your religious organization has an important responsibility when it comes to serving the parishioners of your community. Here at Alliance & Associates, we also have a major responsibility: to protect your place of worship and the members who visit it for spiritual guidance. Our business insurance agency provides religious organization insurance in Orlando, FL, and the surrounding areas for a wide variety of institutions. In our more than 100 years of combined experience in the insurance industry, we've developed the resources and expertise necessary to protect every aspect of your organization. From covering the volunteers who serve your organization to guarding your property, architecture, and unique artwork, we offer tailored solutions for your coverage plan. As of late, churches have become especially susceptible to being the target of lawsuits and legal claims. While not necessarily a substitute for proper risk management or security and safety planning, our church insurance is a worthwhile investment for the protection of your church. It's in your best interest to be prepared for anything that may come your way so that you'll be able to serve the followers of your ministry. With tensions growing as a result of overseas conflicts, Muslim houses of worship have been the unfortunate target of misguided hate crimes in recent years. Our mosque insurance policies provide coverage for followers of Islam to ensure that they are able to freely gather in worship without having to worry about losing their property to vandalism or any other source of damage. We also provide synagogue insurance to protect the places of worship for members of the Jewish faith. These religious centers serve as a location filled with a rich heritage and centuries of history, and must accordingly be preserved in every manner possible. Our agency offers free quotes and some of the best rates in the industry to ensure that your congregation will receive the most affordable coverage possible. We understand that your religious institution is not only a place of worship for your followers, but also serves as a symbol of your members' faith. As a spiritual anchor for families and individuals throughout your local community, your physical location represents a source of strength for those who need it most. With our religious organization insurance, you'll be able to continue serving the people who make your congregation special. 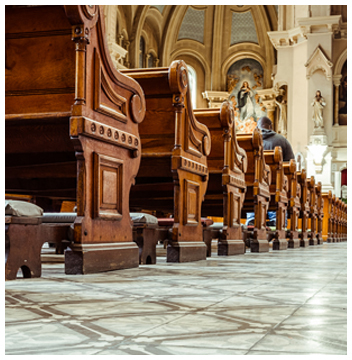 Contact our staff to learn more about our religious organization insurance. We serve clients in Orlando, Kissimmee, Winter Park, Apopka, and Sanford, Florida, and the surrounding areas.